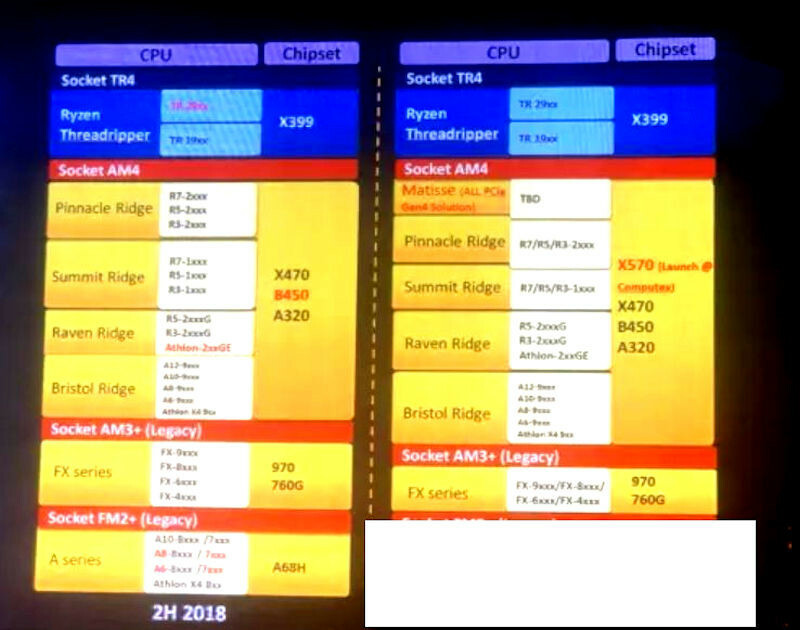 In a development that could explain why Intel is frantically stitching together 10 cores with the "Comet Lake" silicon, a slide leaked from a private event hosted by motherboard major GIGABYTE reveals that AMD's third generation Ryzen desktop platform could launch as early as Computex 2019 (June). The platform will include AMD's first client-segment processor based on its "Zen 2" microarchitecture, codenamed "Matisse," and its companion chipset, the AMD X570. 3rd generation Ryzen with X570 is expected to be the world's first mainstream desktop platform to feature PCI-Express gen 4.0. AMD could maintain the processor's backwards compatibility with older 300-series and 400-series chipset motherboards by shaping its PCI-Express implementation to use external re-drivers based on the motherboard. This could make 500-series motherboards slightly pricier than current AM4 motherboards. Backwards compatibility could mean that unless you really need PCIe gen 4.0, you should be able to save money by opting for older motherboards. In one Zen 2 design, AMD supposedly uses a CCX with six cores and pairs two CCX together on a single die, providing a maximum core count of 48 in a single processor. In another Zen 2 design, AMD uses a CCX with eight cores, and pairs two CCX together on a single die, providing a maximum core count of 64 in a single processor. Given that Intel is preparing a 10-core skylake, I predict Matisse to be a 12-core chip with two 6-core CCX. Nah, it'll just force TR core counts up. Which is why I went TR platform even if I just got a 1900X as a place holder till I either went with the 16 core 2950X or waited till the 7nm stuff. I don't think it works that way. 2700x is still only 3.0 so you'll be limited by the number of PCIe lanes enabled in the CPU, I know it supports more but is disabled by AMD for mainstream AM4. You are gonna feel that upgrade more than most would! Just moved to 2700x. I wonder how much faster the 3rd gen will be. Maybe next year I will move to the 3rd gen with my x470 board :) That depends how much faster it will be from the current 2700x. Either way can't wait to see this new CPU capabilities. Do you know something we plebs don't? ...cause You definitely need all those lanes, when 2080ti barely uses PCIe 3.0 8x bandwidth. Even adding 2 M.2 SSDs and eg. a soundcard, You still have some lanes free on current setups. If there are 64-core CPU with 8 chiplets, I would expect a chiplet has 8 cores. All these cores, and 90% of the software available still runs on a single core or 2 cores. When performance matters, the software required will be as multi-threaded as possible. Most likely,but is it gonna be real 2x8 or 2x2 4 core modules like FX. My money is on second revision of x570 boards with polished firmware or even x670 with Zen2 refresh, just because other players will adapt 4.0 also. AMD introducing new revisions of hardware too fast. First i wanted Ryzen polished and they announce refresh, so i wait for it and a week or two later after release leaks about double density CCXs, i wait for it. Now they have plans for refresh to Zen2 and assuming possible early PCI-E 4.0 issues, awaiting prolonged. 2 years more or less it doesn't matter already, even software and game developers see this trend (and also crypto craziness) and heavily optimize products to utilize current and 3-6 years old hardware. I just want higher clocks. 8 cores/16 threads is more than enough already. If you have extra die space, go ahead and put the iGPU in the free space and use it for low power GPU switching. I just want the CPU to bring the base clock up to 4.2 GHz with turbo in the 4.5 to 4.7 GHz range. Maybe a 2 or 4 core boost mode. Get that I will pre-order it. I'm thinking more and more of jumping the Intel ship and going AMD and not looking back. For all those people who harbored thoughts that Intel was hoarding unicorn chips for a rainy day; today is the rainy day and all they can do is more 14mm lake whatever knock offs. Intel isn't stuck in the mud, they are drowning in a tar pit. Of course, this is my .2 for consumer chips. I have no issues with their server components.